Image credit: by Ahmad Fuad Morad via Flickr, CC BY-NC-SA 2.0 license. Shrub rich in potentially anticancer and antimalarial cardenolide compounds is sequenced in search of biosynthetic pathways. 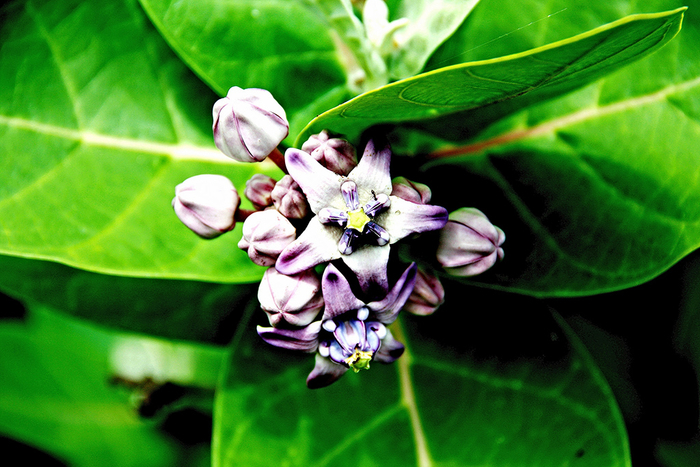 The giant milkweed Calotropis gigantea, a flowering shrub that can grow to 13 feet tall, produces a multitude of chemicals that have possible anticancer and antimalarial properties. A new Genome Report published in G3 describes the plant’s genome, providing a crucial tool for engineering the production of these potential drugs. Parts of C. gigantea have long been used to treat everything from pain to malaria, and naturopaths and practitioners of some types of traditional medicine continue to employ it today. Despite its continued use, however, the plant itself isn’t a suitable medicine—in part because it contains toxic substances that can cause tissue irritation and even poisoning. Among the chemicals C. gigantea synthesizes are cardenolides, a group that includes some chemicals used to treat congestive heart failure and others that are being investigated for their suggested anticancer and antimalarial properties. One way to optimize the yield of these cardenolides for research would be to produce them en masse in an organism that’s easy to grow and manipulate in the lab—but that requires knowing how C. gigantea makes them. Hoopes et al. report an annotated whole-genome sequence of the plant, along with transcriptomic data, which together will help reveal how the plant synthesizes cardenolides. Their work also confirmed the evolutionary relationships between C. gigantea and two related plants that don’t produce cardenolides. Comparing the already-sequenced genomes of these two plants with the C. gigantea genome will help narrow down which genes are involved in the biosynthesis of cardenolides—an essential step toward large-scale production of the drug candidates.